As Christians, we are called to help our neighbors and those less fortunate. Part of Bishop Foley Catholic’s mission and identity is to become servant leaders. BFC is committed to serving the community and takes pride in helping their neighbors. 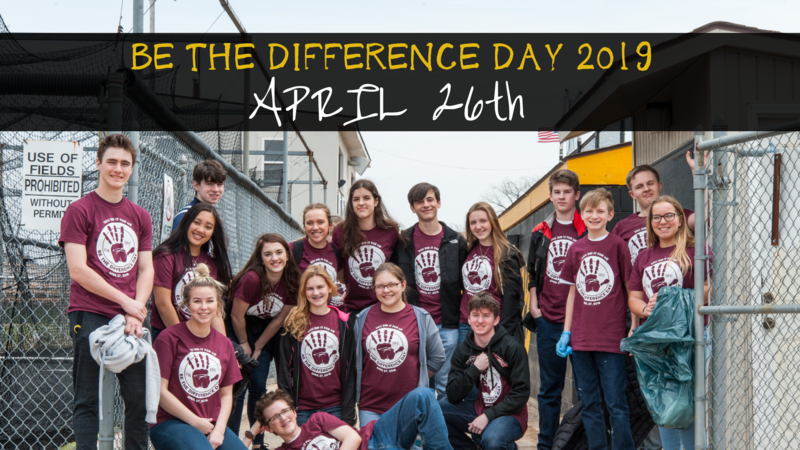 "Be the Difference Day" originally started in 2010 in memory of Foley's former campus minister. This is the single largest community service day Foley hosts with an average of over 500 volunteers. Typically the event is held in late spring. This student led program takes a large amount of planning and preparation. During the initial planning stages, a skills inventory is given to students, faculty and staff to access interests. Event organizers contact organizations to set up service job sites and assign volunteers to a job site based on the results of the skills inventory. In just one day, approximately 3,200 hours are completed! Job sites are located in the metro Detroit area. Past organizations have included Gleaners, Salvation Army, nursing homes, and much more. Specific tasks at job sites vary. Some of them include: painting, cleaning, gardening, serving food, interacting with residents at a nursing home, moving items, building, etc. "Be the Difference Day" volunteers include Foley students, faculty, staff, and administrators. Plus, some parents and students from Guardian Angels Grade School. Participants receive a breakfast, snacks, t-shirt, and transportation to/from the job sites. Volunteers are asked to bring their own lunch. If you are interested in volunteering, please note that all adult volunteers must have completed the free three-hour workshop, "Protecting God's Children" and must complete the three forms below. The workshop is offered throughout the Archdiocese and must be completed before the service day. For a complete list of upcoming dates, visit the Virtus Online website, select "Detroit, MI (Archdiocese)" from the drop down, and complete the registration process. In addition, the Criminal Background Check, Parent Skills Inventory, and Volunteer Driver* forms need to be completed and will be posted closer to event date. They can be returned to the main office either by mail or in person. If you have any additional questions, please contact Ms. Ashley Hursin. *Note: This form is only needed if you will be driving students. Parent volunteers are needed for Be the Difference Day on Friday, April 26th. April 8th is the last day for parent volunteers to be guaranteed a BTDD t-shirt. Please complete the parent inventory & background check authorization forms listed below and email Ms. Ashley Hursin, Mission & Ministry Director at hursin@bishopfoley.org with any questions.